Now that you’ve found yourself a nice, dark sky location to shoot the milky way from, it’s time to discuss how you can actually find it in the sky and plan your shoots for where it will be. Thanks to modern science, it’s possible to pinpoint exactly where the milky way will be in the sky at any point in time. Thanks to some free/cheap software and even phone apps, this information is accessible to regular Joe’s like you and I. 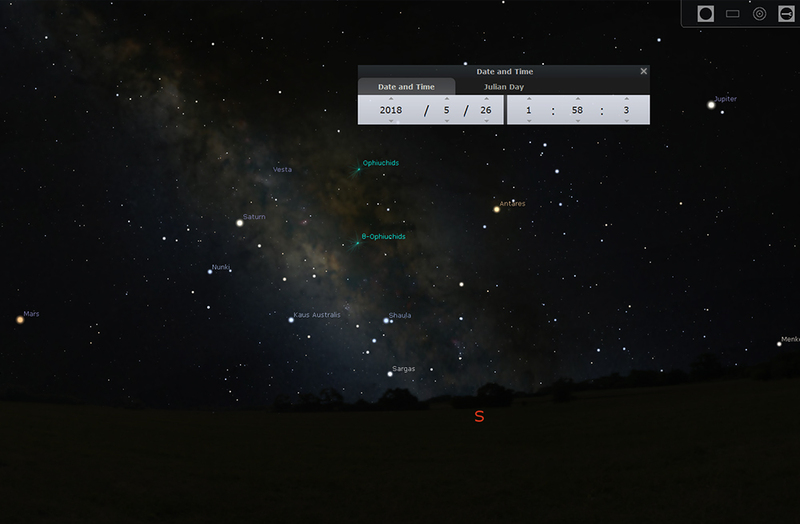 For this guide I will be using an application called Stellarium, which is free for PC, Mac, and Linux. Alternatively, you can do this on your mobile device also using Sky Safari, which is available for both Android and iOS and is actually my preferred method of quick Milky Way planning. I have a guide for Sky Safari Mobile coming soon. Both of these applications do the same thing. They show you what the night sky will look like and where all its objects (including the Milky Way core) are at any time when viewed from virtually any location. But back to Stellarium. Step one is of course to download the software. The latest version can always be found at stellarium.org. By default Stellarium shows the milky way as a bit dim. Just to make it easier to work with I like to brighten it up a bit in the software. 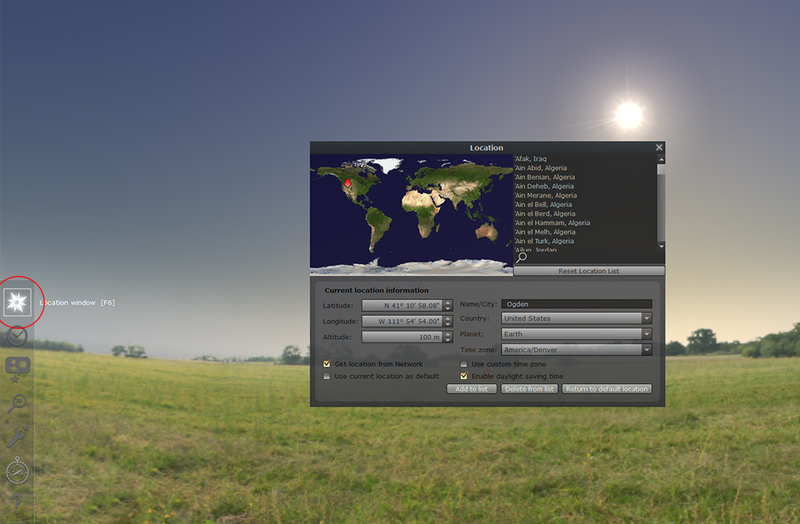 To do that hover over the bottom left side of the screen and choose the option for “Sky and View Options Window”. 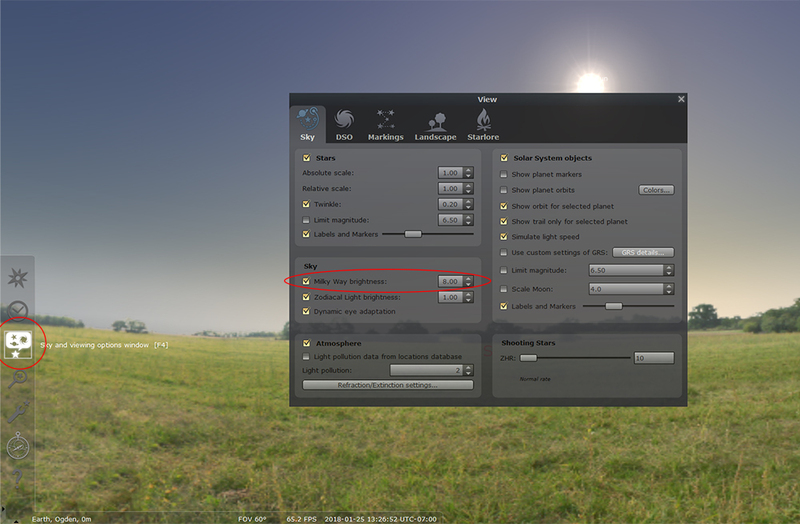 In that menu you will see an option for Milky Way Brightness. I like to set it to around 8.0. Next you will want to set your location. This is important because the Milky Way appears differently, and at different times, depending where you are in the world as well as what your elevation is. Select the location window from the same menu on the bottom left of the screen. From here, you can either select your location from a list if it is available, or a nearby location will work if it is not. If a nearby location is not available you can enter the coordinates manually. If you do enter it manually you can select the “add to list” button so you can just select it from the list next time. Lastly, we need to set the date/time that we want to see a simulated sky for. So for instance, let’s say you wanted to see where the Milky Way core will be from your location at 2am on May 26th 2018, this is where we can set that. Just below the button you clicked for Location Window is an option for the Date/Time Window. From there, things are pretty self explanatory. You can now see where the milky way is at any given time. If you’re looking for a starting point and live in the US or Canada, here is a good start on where to look (don’t worry, I have a trick posted for the rest of you below). March/April – Milky Way core generally appears in the Southeast in the early morning. A neat trick to locating the Milky Way core is to use the search option in Stellarium. While you can’t search the Milky Way core directly, as luck would have it there are some objects that reside near the core that we can search on. The best option in my view is Sagittarius. To search on it, merely select the search option (located just below the location, date, and viewing options buttons we’ve used already) and type in Sagittarius. This will lock the program onto Sagittarius, which will center you on the Milky Way core and even track it as you change the time. If you still can’t see the milky way core try hitting the ‘A’ button. This toggles atmospheric conditions (which include light pollution) on/off. By default Stellarium simulates the visible night sky based on your location so if you set your location as an area with high light pollution the core may be invisible. Hitting ‘A’ turns that off.